This tour saw John Jones and the Reluctant Ramblers walking from Lyme Regis to the Larmer Tree Festival in Tollard Royal on the Dorset / Wiltshire border, via gigs at Broadwindsor and Cerne Abbas. More rain on day 2, but JJ’s blog said “In the realms of pantheistic Reluctant Ramblers moments – and there have been a few – we were about to encounter the best of all time: as we came into the quiet village we spotted four young stoats playing in the lane. As soon as they saw us they scuttled into the hedge, but it was magical. In my years of walking I have never seen anything like it.” That night’s gig was in Cerne Abbas, at The Giant Inn. 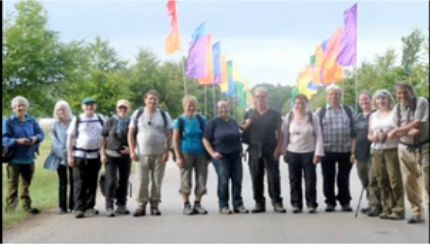 After 60 miles in total – 26 on the last day alone – they arrived at the Larmer Tree festival and a reception committee led by Dil Davies, before playing a gig in The Social on the festival site – and next day an Oysterband gig on the main stage.